I think we underestimate the value of nonsexual touch. It can be so easy to overlook all of the benefits we can glean from giving and receiving affection in ways as simple as a hug or a soft pat on the back. It’s these simple interactions that can really tighten the bonds of our friendships and build trust between us. I think we associate touch so strongly with romantic relationships that we overlook the times people reached out a hand in comfort, and in doing so, we miss out on an amazing resource that we have in times of need. It can actually be pretty risky to reserve physical touch purely for intimacy, the downfall being that our bodies need physical touch for edification, not just from a lover, but simply from people that we love. When we associate touch as a primarily sexual thing, we build up a huge storehouse of repressed physical desire that can get carried away when we are put in a romantic situation. The thought occurred to me that maybe if we recognize the value of nonsexual touch in our plutonic relationships and friendships, it might displace some of the craving that our hearts have for physical intimacy, and our romantic relationships might be healthier and less focused on the physical aspect. Verbal affirmation can do so much for us, and kind words can heal all sorts of hurt, but nothing quite compares to a kind embrace for comfort. Conversations become memories with that little slip of an arm into the crook of an elbow as friends walk through the park, or the firm grasp of both arms in excitement. My favorite endearing gesture: the hand grab. You know, when you and a friend are in the midst of an intentional conversation and you both connect on something or share a nice, deep, gut laugh, and to seal the moment one of you clasps the other’s hand with a tight squeeze. It’s such a beautiful, heartfelt impulse. We need more hand grabs in the world​. Nonsexual touch tends to have almost this supernatural power to ease tension and anxiety. It seems almost impossible to remain stressed after I’ve confided in a loved one and they just wrap me up. It’s like there is a displacement of energy that happens where they take a bit of my burden and I get relief in return. And when we extend this comfort and kindness even to people we don’t know very well, we heal wounds and bridge gaps we never imagined. In Column McCan’s book, Let the Great World Spin, he paints a beautiful picture of a crowd all gathered around the spectacle of a man tightrope walking between two buildings. He describes how “perfect strangers touched one another on the elbows.” It’s a beautiful image, and McCan clearly understands the magic that happens when people draw near to each other in moments of chaos or panic. Any number of causes can bring us together, but it’s that simple touch and connection that really forms a bond. 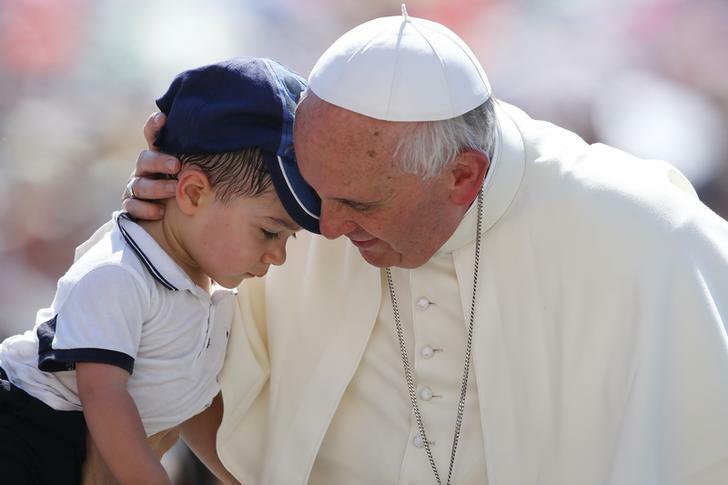 One individual who immediately comes to mind when I think of extending a kind touch to strangers is Pope Francis. On multiple occasions he is seen publicly embracing beggars, kissing children, reaching out to anyone and everyone. It seems like he doesn’t have the capacity to pull away when he sees someone to care for, and he is a beautiful example of how opening our arms can build people up and make them feel affirmed. Physical touch is something I truly struggle with, because it forces me to be vulnerable. It’s not necessarily second nature for me to reach out for a hug, even with my family, not to mention an acquaintance I hardly know. I tend to be more like a stiff board when it comes to nurturing and embracing. But every time someone else extends the gesture, it’s such a comfort. There’s almost an empowering effect, and an unspoken understanding of closeness that can truly boost my confidence. I think if we all dug deep into the innermost cravings of our souls, we would all arrive at nearly the same place: the desire to feel loved. And I say ​feel​ loved versus be loved, because it’s easy to assume that people know we love them, but when we reach out and touch, when we declare in a tangible way how much they mean to us, that’s when they truly feel validated. Non-sexual touch can not only enhance our relationships, but I think our bodies need it. Instead of saving our physical contact just for our significant others, we should work towards being generous with our touch towards friends, family, and even strangers. When we arrive at a place where we love people, and are willing to care for them in our hearts and with our words, it can really make a difference to take one step further, and extend a hand or a kind embrace. ← Is My Singleness Making Me Selfish?